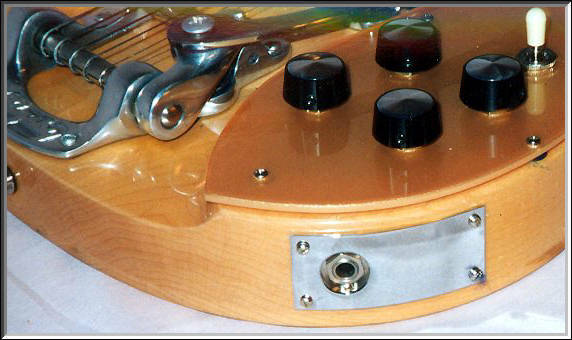 pickguard in the shape of Lennon's with the correct knob placement, mounted off the body with rubber bushings. The switch tip is cream. The bridge is the Bigsby bowtie. 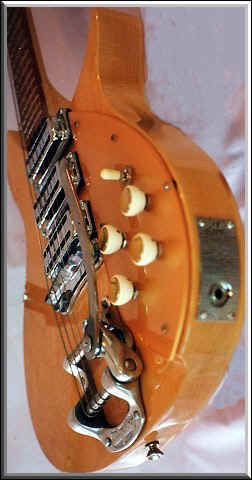 The jackplate is a repro of Lennons elongated Combo 850 style. The strap buttons are from a '50s Fender. I put them in a vise to get them oval. The knobs are repro Hofners. The correct knobs for the Hamburg mapleglo look should be the Zenith radio knobs. I have a set on order from Japan. The strings are .013 ga. Pyramid flatwounds. "... 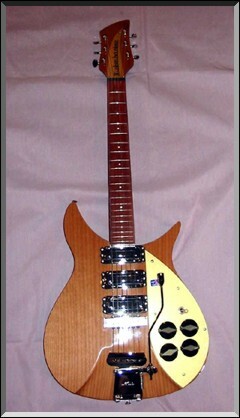 I wanted to update you on my ongoing 325v59 Mapleglo Hamburg Lennon conversions. 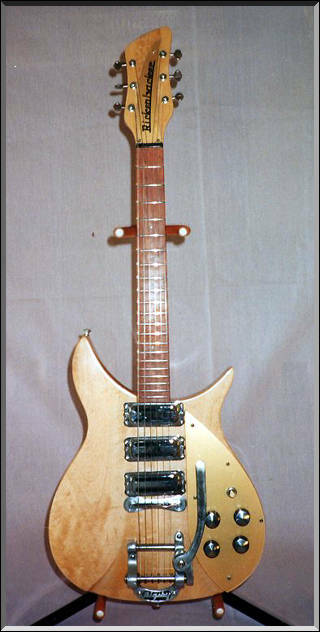 I have a 325c58 on order, so this guitar will eventually be painted black, install a set of JETGLO replica Burns knobs, remove the black paint on the B5, and add a black switch tip. I've done some additional conversion procedures. I used a heated 5/8" drill bit and put mold impression circles on the ends of the black strip of each pickup. I repainted the black on the B5 Bigsby. 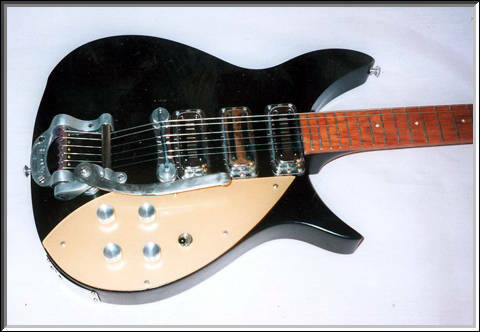 The black paint was not removed from Lennon's 325 until the guitar was painted black. I also did some Selmer Bigsby conversions. I installed fake string anchor bar screws. I sanded the entire finish to better replicate the casting procedure of the Selmer B5. I reshaped several components, especially the more rounded end of the unit and the thinner lettering. I installed more correct slot head mounting screws. I moved the elongated jack plate to the correct position, closer to the end. The jackplate now has Lennon's serial number of V81. I drilled the mounting holes that remained from the original Kauffman vibrato. I found a strap button that is much closer to the correct one than what I was using. It is not exact. It was a non-original set that I found on an old Duo Sonic. I've got a natural finish 325c58 on order that should arrive soon, so I decided to paint my 325v59 black.Here it is with Hofner knobs. 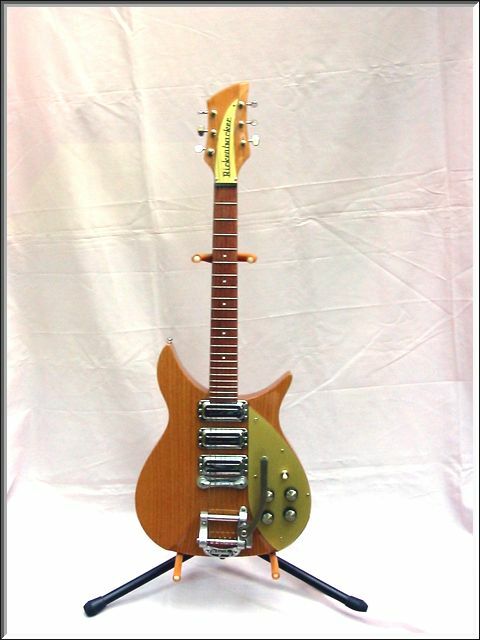 This is the same guitar with the JETGLOW Burns style knobs. I made a white pickguard for it and put on a set of the new JETGLO knobs and bridge for the "as it is now" look. I've included a close-up of the body. 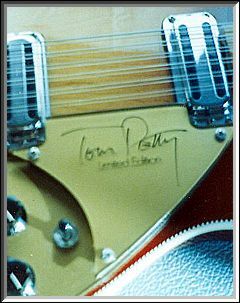 I also replicated the damage to Lennon's middle pickup. 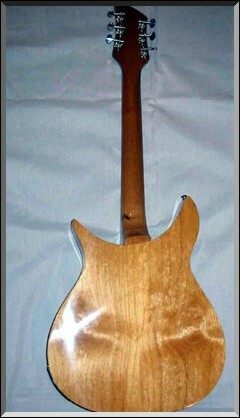 "...I finally got around to doing the correct Lennon "Hamburg" modifications to my natural finish 325c58. I've replaced the Kauffman with a modified Bigsby B5 and a Selmer style Bigsby Bowtie bridge to replace the stock roller bridge. The Rogan-style "oven" knobs were replaced by replicas of the the radio knobs installed by Lennon in Liverpool. 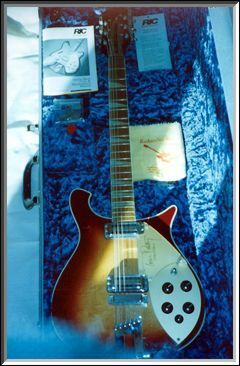 This was the configuration of Lennon's 325 during the recording of the Please Please Me LP...."
I did a few more mods to my 340JG. I installed the Kauffman and roller bridge that came with my 325c58. The headstock was trimmed and I installed Schaller tuners. 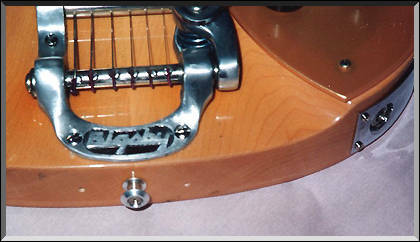 I installed slot head corner screws and rubber grommet mounts on the vintage style pickups. 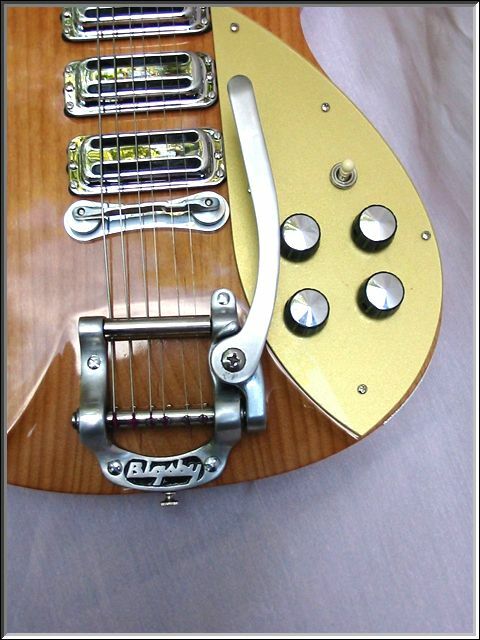 I installed a four knob gold pickguard. If I could get this refinished in Montezuma Brown, I'd be a happy camper.